This side to side shawl is quite addictive. So far I'm extremely pleased with how easy the pattern is and I'm able to knit while talking without making a mistake. The pattern is named Nae, I could see me knitting this one again with many different colorways, so pretty don't you think so? I finished my cowl last week, now I'm patiently waiting for some cooler weather. Okay, impatiently waiting for some cooler weather. It's so soft and cozy! My ravelry page for that cowl is here. 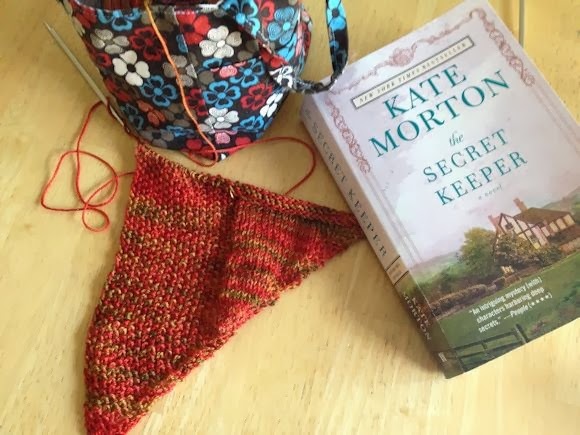 The Secret Keeper by Kate Morton is an excellent book so far. I've read all of her other books and I adore her style of writing. She seamlessly weaves between the present day and the past. I love reading and tumbling gently into the plot. Each page has me questioning more and wishing I could just sit and read all day and all night long. Karen, I love your dew drop cowl and have fav'd it on my ravelry page. A knitter/librarian friend told me about a series I had not heard of before by Alan Bradley . . . book one is "The Sweetness at the Bottom of the Pie"
Love those colors! Very Fall-like! oh, yes----another gorgeous fall knit....I'm lovin' it, too (of course!!! I'm such a copy-cat!) Happy hump day! Ohh the shawl is lovely! I love the fall colors. Sending you some cooler Autumn weather wishes. It's chilly here this morning. I'm loving it! I love side to side shawl/scarf patterns. I find them easy to memorize and they grow pretty quickly. That color is simply gorgeous! I love that color Karen - but I am partial to that side of the color wheel ;o). I second your comment about cooler weather ! LOL - our weather people have promised cold winds from the north this week - bring it on! The colors in the shawl are beautiful. Perfect for fall. I saw that book at Costco yesterday but didn't pick it up since I feel like my books to read shelf is way too full for any additions right now. But I'll keep it in mind. Love, love, love the colors of the shawl, so rich and "fall" like. :-) The book sounds like a very interesting read, I'll have to add it to my book list. I'm still reading The Acidental Tourist and like you wish I had time to read all day. Your shawl looks lovely I hadn't seen that pattern before. My needles arrived and I'll soon be starting the Annabel just a few small things to finish off first. Great color choice. Easy shawl..I'm adding to favorites! Oh, yay! Another Nae! I can't wait to see it done, Karen! Mine looks much the same... I keep it around for when I need something simple, but am pretty sock obsessed right now! i'm so envious of how many books you make it through. i read a few pages of a parenting book, or a New Yorker and that's all I can muster. My mom has recommended Kate Morton to me I think, maybe I should check out what the library has... I love the colorway of your new shawl. What a pretty yarn! I just updated my "to read" list and The Secret Keeper is near the top. It has been recommended so many times. Your Nae is looking beautiful! I have not read any of Kate Norton's book, but will be adding this one to my list. Thank you! I've enjoyed Kate Morton's book too. I love my books on audio - pop on head phones and I can multi task while someone reads me the story - you might like it too then you can knit and read. I can't wait for cooler weather either. It's a bit rainy and cool today and I'm in heaven. Oh, how lovely! It is raining here today, and it feels like perfect knitting weather! Excited! This yarn makes me yearn for the shawl I started last autumn. I read Kate Morton's Forgotten Garden and loved it beyond words - I really ought to grab another of hers soon! What a great color for October knitting! Pretty color yarn! I love Kate Morton too, she is always a good read. 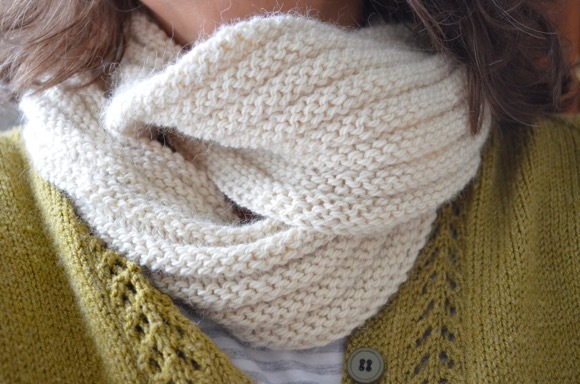 your colorway is perfect for fall! That shawl does look lovely. I'm a fan of the Faroese shaping for shawls. I didn't join in YA this week but I did whip up a couple baby hats. :) They are always so fun: quick knits and adorable. Lovely autumn colours... And I'll check out that writer, sounds great! That will be a very nice shawl. 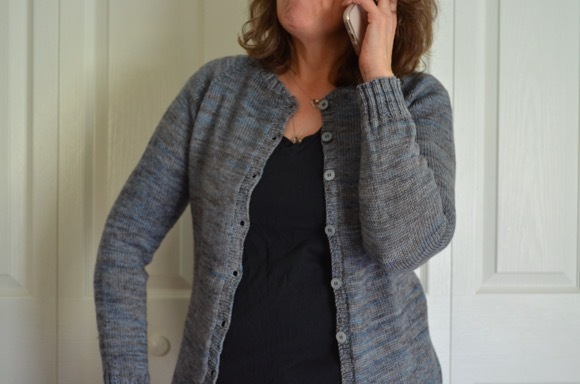 I've wanted to knit a side to side design so I downloaded the pattern.